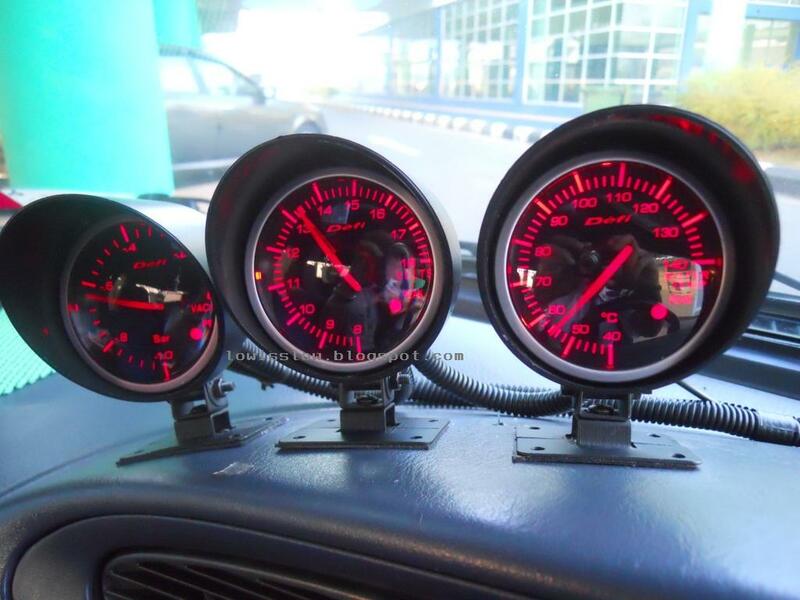 Picture 4: GAUGE REAR VIEW. Both left and right socket can be use for power input or output. Middle is for sensor socket. Okey, let’s start from Installing VOLT gauge. This is the easiest gauge to install. You just need to follow the wiring diagram below. 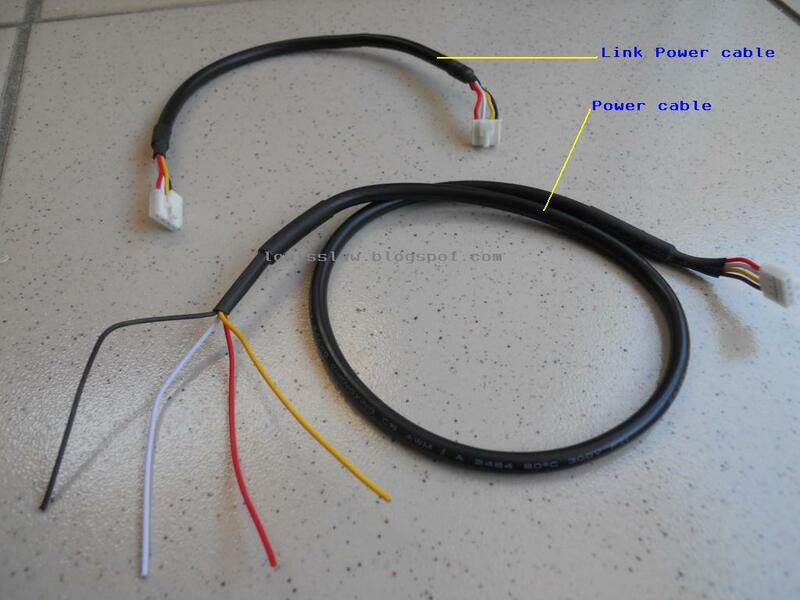 Make sure you have the wiring kit as shown in picture 3. Use power cable supplied with the gauge. There is 4 wires in 1 cable that is Red, Black, white, and Yellow. If the cable provided not long enough to the gauge mounting point, make an extension by using proper wire. RED connects to the constant 12v positive or from positive battery terminal. If you connect it to key "ON" or "ACC", the closing ceremony function will not work. BLACK connects to the chassis or vehicle body, which is negative (-). WHITE and YELLOW, you can choose whether you want red color as your gauge background light or white. If you want white as gauge background light, then connect WHITE wire to key "ON",　and YELLOW wire to small car light wire. You need a Test Light to find these wire.So that, whenever you start your car, the background color of the gauge is white, and when you turn on lights, the gauge background color change to red. Recommended white because red colors are not really visible in daylight. If you want red as primary color and white as a secondary (at night) background color, just swap the wire. Then mount the gauge where you want, and feel it. hi,just wanna ask, r u using defi link controller unit? y my temp was at 95°~110°? is there something wrong with my wiring or my sensor? My friend's viva (Elite)operates between 85-95, when the needle reached 94 degree Celsius, the radiator's fan will start working. so on with my Kancil. Based on my experience stuck in traffic jamm for almost 4hours (idle)with my Kancil, when the temperature reached 100 degree/c, the rpm will also rising to 2k, decrease in vacuum (based on my vacuum gauge), and aircond start not working. Almost overheat!! But not very sure with Viva. Try to flush/service cooling system especially radiator tank, check waterpump and thermostat. Nothing wrong with wiring and sensor. You meant you don't want the buzzer sound when temp above 96c?. Default factory setting for gauge to triggered (buzer sound) is 110c. That's mean you already adjust the warning set point. You can adjust it yourself where you want actually. To adjust it to set point you want (recommended 100-110c), just press set button behind the gauge more than 6sec. then release it and one more time press and hold it until the gauge's needle moving..release it where (100-110c)you want it triggered the buzzer. I noticed that there was no buzzer sound for this (water temperature) gauge. I have make an experiment about this..when the needle hit the dedicated set point, it only blinking (the whole gauge lights) instead of buzzer sound. Tq....then how ti decrease the temperature? you meant to decrease the temp set point? just press and hold set button more than 6 second and release, press and hold it again and the needle will move clockwise and counter-clockwise when it reached 140'c. hello. you are wrong sir, instead of blinking, the defi meter could have buzzer sound. it depends on how you set. push tiny little button at the back of defi meter, then you could see blue LED, after that, push and hold the back button to set the set points. while there are "NO" blue LED appear, hold back button for about 6~7 sec, until you hear "beep" sound. this is to turn ON-OFF the buzzer sound. NOTE: for RPM meter, i found out that you can set the number of piston your engine has. make sure the defi meter is in RED colour. then refer to (setting 1) to set the number of piston. this things is quite cool, even though it is made in taiwan and cost around rm50. haha..
You're right sir about the buzzer sound..sorry i forgot to update it here after i found it out.. Yes, it depends on how we set it to be. Thanks for that..
About the RPM gauge, I never thought that it can be set according to the number of pistons..I will study about this later. Thanks again for sharing..
Agree with you..this gadget is AWESOME!!. can't afford to buy original..
How can i set the number of piston my motorcyle? 2nd, Sorry bro.. I never install any AFR defi gauge.. better you ask performance tuner to do that. It is about fuel bro..
hai WTS.. my meter start 20*c. but went i on key it set 40*c i change my sensor but it dont ok. why? 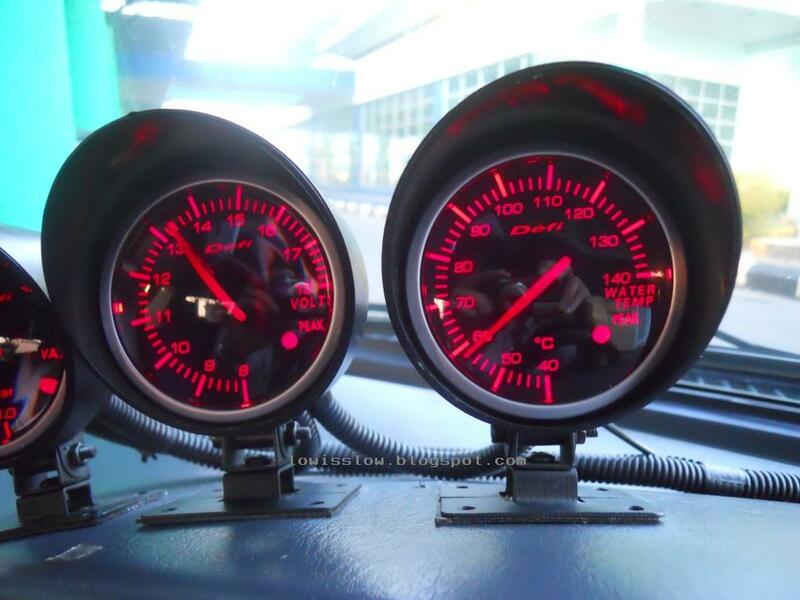 hi..do u have installation manual for defi tachometer? 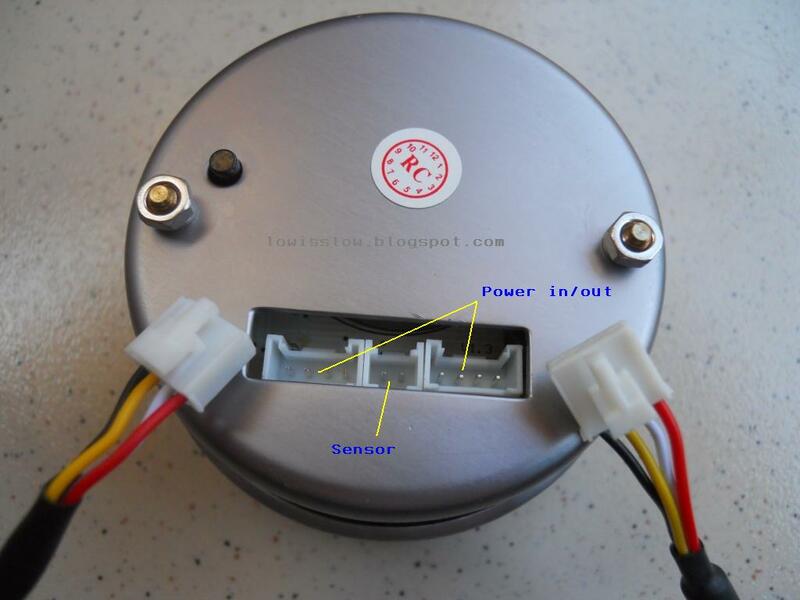 sensor socket got 2 wire rd & black..where this wire need to connect? can i connect the red wire (rpm) and black wire (ground) from my ecu pin out.? Yes if you can find it..
How to make the background lamp color red all the time.? Just connect YELLOW wire to ON/Key ON. WHITE wire just left it unconnected. the gauge not working if YELLOW connect to ON..any idea? If White wire connect to ON..there is red light during opening ceremony. Hi bro, my water temperature gauge does not seem to be working. i pluged the link cable to the other defi bf gauge, and the sensor white wire to red gauge wire, and black to black. But it does not seem to work. it only turns on, but after several minutes, the gauge reading still doesnt move. My in-car stock water temperature needle however has already moved to almost half the bar. All the light turn ON right? Maybe problem with the sensor. Or tab one wire to BLACK wire (sensor) and another end to the car chassis. If still, try find another sensor from auto parts store. bring the original as a sample..
yes, all lights are on. i did tab one wire to the car engine grounding. still didnt work. i guess i need to replace the sensor and see how. Thanks! I have installed Defi Volt meter on my Daihatsu Sirion, I want to remove the buzzer sound from the unit, please advice. Thank you. Refer to the manual given.. I can't remember as now i'm not using this type of gauge. My manual also don't know where about now. Im sorry bro..
hallo.. why my defi bf meter no closing caremony??? Make sure "RED" wire connect to constant +12v.. constant 12v meant that, the wire always got current even you turn off your ignition key. You need a Test Bulp to identify this wire.. every car's models have a different wire code/colour. hai...before my defi meter dont have close ceremony, because my meter power wire are connected to the acc key.. but, when i change the wire to the positive battery terminal, also not have close ceremony. instead, my meter are always on whenever i on or off the ignition key... so, how can i fix this to make close ceremony function? Small light wire from any small bulb that will be switched on when key switch to on. i bought fake defi too but that is enoght to work for me.I wound like to ask some question for Defi Volt Meter gauge.When i install Volt Meter Gauge need to sensor cable or not?when i brought, not have sensor cable in the box. Hi i want to change the number of piston but how to change the meter to the red colour...i try many time but still cannot...anybody please help??? My rpm needle keep dancing between 2500-3000 rpm while engine is in idling mode (should be 900-1100). How to correct this problem? This is a very interesting blog. This written article deserves the best rating.